This is a picture of Kiara. Kiara arrived at the Rescue Center in 2007 as a scared 7-week-old kitten. She gradually overcame her fears and was ready for adoption, or so we thought. Three times since her arrival a family has come in and fallen in love with Kiara. Three times she has been chosen. Three times she has gone to a forever home. Three times she has come back to the home where she feels safe. Each time, she was returned because her new family just could not bear to hear the pain in her cries. Kiara would hide away in fear and wail non-stop. She was returned out of love and each time when she returned home to her safe place, Jacci would open the carrier and out Kiara would stroll, eat a bit then jump up on the dryer and take a nap. The last time she was adopted, she lost almost 2 pounds, having eaten almost nothing. Once back to her safe place, her appetite quickly returned. Kiara is now in her safe place forever. There are more than 60 cats that are residents at the FFRC, including Residents, Covies, Porchies, Firecats, and Barnies. There are many more cats that call FFRC home, for now, until they find a forever home. But all the residents will be with us until it is time to cross over the Rainbow Bridge. They have found their forever home and it is at FFRC. Each resident is here for different reasons. It is never an easy decision to say, “This one will not be adoptable.” The decision is always made with the best interest of the cat in mind. Sometimes we know all the details, and sometimes we wish we didn’t know. Most of these cats, especially when it comes to the Covies and Porchies, are here because of horrible pasts. That is the case with many of the main center Residents. But whatever brought them here, they look forward, not back and so should we. They rely on FFRC to provide everything for them, and FFRC relies on us to help them do just that. One way to help is to Sponsor a Cat. It costs $20 and that donation will help care for the cat for one month. 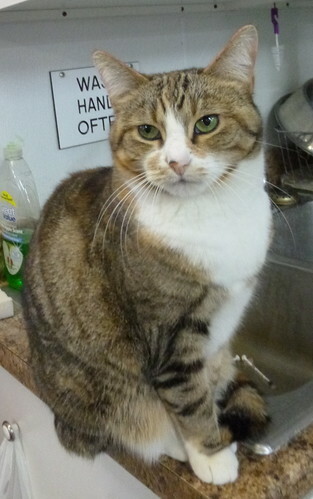 You can sponsor any cat, but we hope you can sponsor the Residents. If you prefer, you may send a check (payable to Friends of Felines Rescue Center) or use the PayPal button to send the $20 sponsorship fee. Again, be sure to specify which cat you are sponsoring. Once you sponsor a cat, you will be mailed a special certificate of sponsorship and either a button, magnet, or picture of that cat. But getting a pin or magnet or picture isn’t what this is all about. It’s about reaching out to help FFRC continue their mission of ensuring that Every Cat Matters, even the cats that so many people have said “NO” to. These are the cats that FFRC said “YES” to. These are the cats that are allowed to be the cats they were meant to be, whether they are like Kiara, or have had injuries like Asha, or have CH like Derecho. These are the cats that are home, here at FFRC. Alma, Asha, Coralie, Cutie, Derecho, Farrah, Hensley, Jessie, Kiara, Magic, Pania, Ramsay, and Vernon. Mayor Anony, August, Charley, Dollop, Dude, Jackson, Jersey, Lucas, Nikka, Oliver, Rolland, Rory, Sevaun, Sylvan, Timothy, Victor, and Walter. These are the cats that need us the most, the resident cats of FFRC. Thank you for supporting them and supporting FFRC.